Owning a pet ant colony can truly be one of the most intriguing, educational, and rewarding experiences. There are several things to know in order to properly care for a pet ant colony. The following are the most commonly asked questions about caring for pet ants. NOTE: Be sure to also check out at our store the AntsCanada Ultimate Ant Keeping Handbook™ E-Book, an all-inclusive everything-you-need-to-know e-book on pro ant keeping, with all the latest and updated info on the ant keeping hobby. It’s definitely a resource every ant keeper should have. It even has a section on the care of specific ant species, and a complete glossary of ant-related terms. 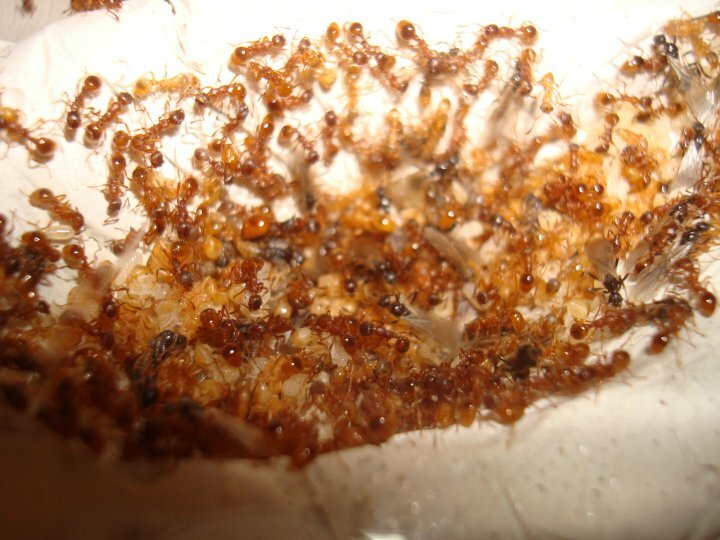 A mature Myrmica sp ant colony with workers, alates, brood, and queen. Where do I get ants to stock my antfarm? Click here to find out how to start your ant colony. Can I mix different species of ants in one formicarium? No, they will war and there will be deaths. Even ants of the same species from a different colony will fight. Colonies identify members within their colony with a distinct colony scent, and any ant that doesn’t carry that scent is considered an enemy. Never mix your ants! What are the best ants to keep from my area? There are literally thousands upon thousands of species of ants in the world. In a single region there can be up to thousands of species, so it’s impossible to say which species is easiest to keep. Lucky enough, however, almost all species found can be kept successfully in a captive environment with the right care, housing, equipment, and conditions. Please refer to the AntsCanada Ultimate Ant Keeping Handbook™ Ebook for an Ant Caresheet section for a list of the most common species of ants kept as pets and details of their preferred living conditions. What am I supposed to keep my ants in? 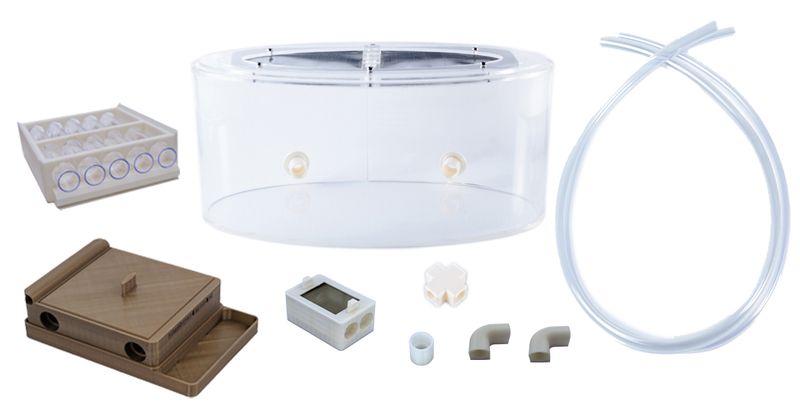 We offer great, easy-to-use “All You Need” Starter Kits at our shop which contain all housing and equipment required for ant keeping. A newly captured queen ant should be placed in a test tube setup (See Starting Your Ant Colony section). When the queen has many workers, you may then transfer them into a proper ant setup. A proper ant setup consist of two units attached together through a tube. First, you will need what is known as a formicarium, the area in which your ant colony will nest, where the queen and her brood will reside and the workers will commune. We offer an array of top quality formicariums at our shop, including our ever popular Omni Nests™ and brand new, state-of-the-art, genus-tailored Hybrid Nests™. You will also have to attach the formicarium to what is called an outworld which simulates the outer world where the ants will forage for food and establish their garbage sites and graveyard. The “All You Need” Hybrid Gear Pack includes, formicarium, outworld, and accessories needed for every stage of ant keeping. What is a basin/outworld and why do I need one for my ants? In the wild, ants leave their nests to forage and hunt for food. They have a system using pheromones (biological chemicals used for communication between ants) which allows the ants to locate where food may be found once a single ant discovers it. Watch this video for an example on how their pheromones for tracking food work by clicking here. Naturally ants will be compelled to leave their nest and bring home food for the rest of the family, which leaves you with the fun task of creating an outworld for them, where they can wander and forage around for food. It’s a much better and more natural method to feeding your ants than having to open your ant nest and risk escapees and other such hassles. See the outworld as their sort of ‘grocery store’. Our top-of-the-line AC Outworlds™ available at our shop are specially designed to create this ‘outer world’ for your ants. Your ant colony’s outworld (known in ant keeping as a ‘basin’) should be open and should generally offer much more space than the nest. Especially true with larger colonies, the bigger the outworld, the better so you can see more natural behaviours, e.g. ants forming impressive trails to and from food. You can place the food like live or freshly killed bugs, fruit, honey mixed with water soaked into a cotton ball, and meats directly into the outworld for the ants to eat. Be sure to remove any uneaten food. Also, they will create areas for piling the dead in the outworld so be sure to clean them up as soon as you can. How do I prevent the ants from escaping? There are several ways. In the ant keeping world we use common deterrents to keep ants from escaping through little cracks or open spaces. We at AntsCanada like to use vaseline (petroleum gel) and smear a two inch wide band around the outworld door and its joints. Most ants come in contact with it and don’t bother walking through it. Those who have ants that still travel over a two inch thick band of vaseline smeared around the top of the outworld, can also use baby powder (talcum powder) mixed with rubbing alcohol, and smear this mixed substance instead. If you choose this method, be careful not to put too much because the ants can get coated in it and die. Another deterrent commonly used in Europe is paraffin oil. If all of these fail, the most effective deterrent is Fluon or a substance called PTFE, however if you choose to use this substance remember that the fumes before drying is highly toxic so apply it to your outworld in a well ventilated area and before your ants are given access to the outworld. Fluon/PTFE is also known commonly among laboratories working with insects as the product ‘Insecta-slip’ and it can be purchased at an online store known as Bioquip. If you are using an AC Outworld™ you can place the deterrent on the bottom of the upper lip so that it does not look unsightly or cause obstruction when viewing your ants in their outworld. The AC Outworld makes a very attractive piece in any ant setup, especially when they are naturalistically designed. What will you do when the young queens/males of your colony decide to have their nuptial flight? Won’t you have tonnes of flying ants in your home? You will be surprised to know that in our experience, ants kept indoors don’t seem to undergo the mass nuptial flights in the same manner that the ants outside do. The suspected reason for this is because in the wild, specific environmental cues (e.g. temperature fluctuations, humidity, photoperiod, etc) trigger ants to decide to undergo their nuptial flights for mating. An ant colony kept indoors however, where the environmental conditions are always kept relatively constant, don’t receive those same environmental cues, so they usually don’t end up flying on schedule. Instead, these young, winged queens/males, exit and re-enter the nest at whim and wander around the outworld a little. Eventually, many of the males die, and the females after wandering break off their wings and surprisingly, start to act like worker ants, helping out with worker ant duties. These queens eventually die, as well. In our experience, there were only a few males that attempted and successfully flew out of the outworld, but not many. However, if you are concerned about alates taking to flight and notice that your alates are indeed flying or showing signs of flight, you may want to move your entire setup, i.e. 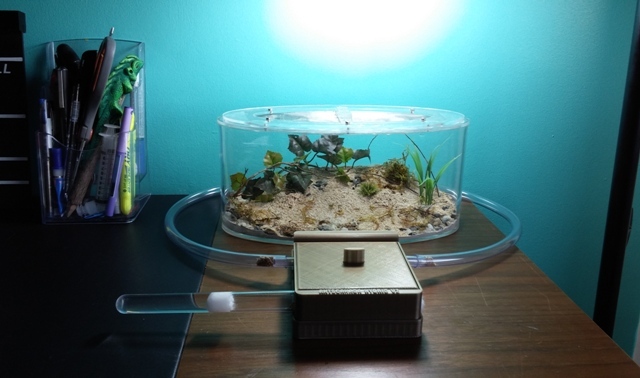 formicarium and outworld, outside in a well sheltered area (where they cannot get rained on and drown) with the outworld door open so the alates can fly. Under no circumstances should you do this if you are keeping non-native ants! If you are keeping non-native ants you will have to keep your outworld closed and simply allow the alates to die out naturally. Will my ant colony grow only as large as their nest? If I get my colony a very large ant nest, will it cause the colony to grow bigger and/or faster? As a rule of thumb, you should start with a small ant nest if your ant colony is small. Don’t give them a nest bigger than your colony needs. What you will find if the nest is too big is the ants will store their garbage in the hallways and chambers which will cause a mass mold outbreak, endangering your colony. The idea is to have the ants gradually grow into their nests, getting them to move into bigger nests as the colony grows. Make no mistake – if the conditions are right and there is enough food they will continue to multiply (depending on the species of course). You can limit an ant colony’s growth by limiting food (particularly protein food sources) or lowering the temperature slightly once the colony has reached desired size (see Ant Tutorials). Do you suggest putting 2 mated queens of the same species in the same habitat for a more likely chance one will lay eggs? You will have to research the species. There are some species that are called polygynous meaning they tolerate many queens in the nest, and get along throughout the founding colony stage and afterwards. There are, however, many species that undergo pleometrosis, where two or more queens will raise their young together peacefully up until the first workers come, and at that point the queens kill each other until one survives and/or the workers kill all but one queen. This however can lead to sustained injuries with the surviving queen, often leading to death, and in the past we’ve had queens kill each other leaving the young workers orphaned. In nature, pleometrosis increases the chance of the colony’s survival, but seeing as you will be the colony’s protector and caregiver, they won’t have to deal with the same obstacles queen ants deal with in the wild, making pleometrosis unecessary. If two queen ants are placed in a very large setup, e.g. a large habitat nest or two large habitat nests connected to each other a condition known as oligogyny may occur where suddenly rival queens will disperse to different areas of the nest and found a colony together that way. Either way, if you do decide to mix queens, do so with caution and know the consequences. What is the secret to get my ant colony bigger faster? The two factors [under your control, anyway] that affect the queen’s rate of egg production are heat and food availability. Ants like all insects are cold-blooded [aka poikilothermic] and the rate of all their physiological functions depend on the heat of their surroundings. With a heating pad under one side of the nest (only warm up one side so that the ants can thermoregulate and move to whichever side they please when they please) warming up a portion of the nest to around 25-27 degrees C, your ants will in essence ‘rev up’ so to speak, including the queen and her egg production. Another simpler way to heat your ants is by simply placing your colony’s nest in a warm room of your home. This is also a practical method of keeping your ants warm when you own several ant colonies. Never place your ants in direct sunlight. You will fry them! Food, food, food! Give your colony the steady supply of nourishment it needs to grow. Feed your ants as much as they will eat, especially proteins like insects. We have found success in feeding soft cooked seafood like small pieces of crab and shrimp. Be careful not to feed them too much that they begin storing copious amounts of food in their nest that remains uneaten or buried. These forgotten stores/leftovers will grow mold and pose dangers to the colony. Yes, at that point the colony would die. You can try to introduce a new queen, but chances are they will kill her. Some queens however can live for 15 years, so that’s a very long time. What foods should I feed my ants? Ant colonies require a protein food source, a sugary food source, and water available to them at all times. Watch our tutorial on ant feeding and nutrition here. What foods should I NOT feed my ants? Try to stay away from feeding wild insects that are collected from or around areas that may be sprayed with pesticides. Golf courses are an example of such pesticide-ridden places. When in doubt feed crickets and mealworms bought at a pet store. Be sure to cut up the mealworms with scissors before feeding so the ants get into the goodies. How do I give my ants water and how much? There are several ways to provide your ants with water. You should remember that providing ants with a water bowl can lead to ants drowning. There are other safer options. You can fill up a test tube with water and plug the end up with a cotton ball, and place the whole test tube in your colony’s outworld. The ants will drink the water directly from the cotton. Also, most ant species like their nests moderately to very moist. The nest’s moisture level should match the moisture preferences of the particular species you’re housing, and that information can be found online. Refer to our AntsCanada Ultimate Ant Keeping Handbook™ for an Ant Caresheet for specific nest moisture preferences of the various commonly kept ant species. What are your opinions on the popular Gel Ant Farms? We initially loved the idea of keeping ants in a medium that also fed them, and in 2009 we excavated a very large Myrmica rubra colony to house in a gel farm, and study its effectiveness as a long-term home for ants. Unfortunately, the colony dropped in population by nearly 30% in the first week and the surviving members went into a sort of hibernation state. The young were also disappearing. It took them almost two weeks to begin digging tunnels in the gel and by then the entire gel nest began to mold which endangered the colony. Perhaps the ant nest was built to accommodate the more stout harvester ants (the live ants that you can order via mail), but in the end, we had to release the colony back into the wild. The ant community remains uncertain on the gel farms. Many experts say that the gel farms are not suitable for long-term serious ant-keeping but are OK for temporary ant housing and observation, while some go so far as to say it’s dangerous for ants and should not be used. But if you are currently housing your ants in a gel farm, don’t panic and don’t feel bad. We here at AntsCanada love the Gel Farms because of the widespread awareness that the popular gelfarms are bringing to people about ants. It has wonderfully introduced to many around the world how truly interesting and miraculous the creatures are, thus causing them to venture out into the world of serious ant keeping. The choices on how you house your ants are up to you, and as always, continue to do your research when making decisions for the pet animals you love. They hibernate [See ANT BIOLOGY section]. How does one hibernate ants? How long do you keep your ants in hibernation and when do you wake them up? In Toronto, Canada, it starts to drop below freezing around November or December and ends around March. So I keep my hibernating ants on a similar schedule of around 3-4 months of hibernation period. In this time, we place all our ants in their entire setup whatever it may be (i.e. test tube or formicarium and outworld) in a cool basement storage room where there is no heating. A garage or attic would do the trick as well. IMPORTANT: Throughout the hibernation period, your ants won’t require any food, however they dostill require water. Therefore, unless your ants are in a test tube setup, you must ensure the formicarium continues to stay moist like usual, which means you may have to check up on the formicarium on a regular basis to ensure the colony is properly hydrated. The good news is that a cold nest doesn’t lose moisture as quickly as a warm or room temperature formicarium, so you won’t have to water the nest as frequently as you’re used to during the warmer months. Some place their ants in a fridge under low setting (i.e. the warmest the fridge can be). Under these conditions, the ants can stay cold enough to undergo a proper hibernation, but warm enough to not die. In the wild, ants underground are able to stay a few degrees warmer than the ambient temperature above ground. Do not place your ants and formicaria outside during the winter, as they may freeze to death. Here is a helpful video on ant colony hibernation https://www.youtube.com/watch?v=Xf8p_23z-Bg and another video on hibernating your queens and starting colonies in test tubes http://www.youtube.com/watch?v=BDgleH51Kd4. Do I have to hibernate my ants? What happens if I keep my ants in warmth throughout winter? Yes, it is recommended that you do hibernate your ants if they are from a temperate region (i.e. place with a winter season). Even if you try to keep your ants warm during the winter, your ants will probably still hibernate anyway. Those who keep their ant nests warm through the winter months may notice their ants’ activity and feeding level drop drastically. Summer-like environmental stimulants aren’t enough to keep ants from hibernating as they seem to run on a biological clock. Many experts say that ants from temperate regions should be hibernated for at least a month or so, and failing to do so shortens the lives of the queens who miss that solid break from the physically demanding task of egg-laying for a few months. Others argue that hibernation is not necessary. For those like us here at AntsCanada, who care for very many ant colonies and some with thousands of members, the winter months offer a relaxing break from the demands of ant duties. There are very few pet animals one can keep that allows for that refreshing break and yearly return. It’s what keeps ant keeping so fresh and exciting for years and years! What is the youngest age you believe a child is ready to care for an ant farm? The answer to that varies. I was caring for ants as a youngster, but it really depends on the child’s sense of responsibility. There is nothing wrong with purchasing a formicarium for a young one (actually, we encourage it, as it starts biology and ecology education early) so long as you foresee that all the needs of the ants are met and that you closely supervise the child as they are in contact with the ants. It can be easy for an unsupervised three year old to break open an ant nest and get seriously injured and also seriously stung or bitten! Most parents feel age 10 with supervision would be an acceptable age for ant keeping, and they would also truly comprehend and appreciate them.